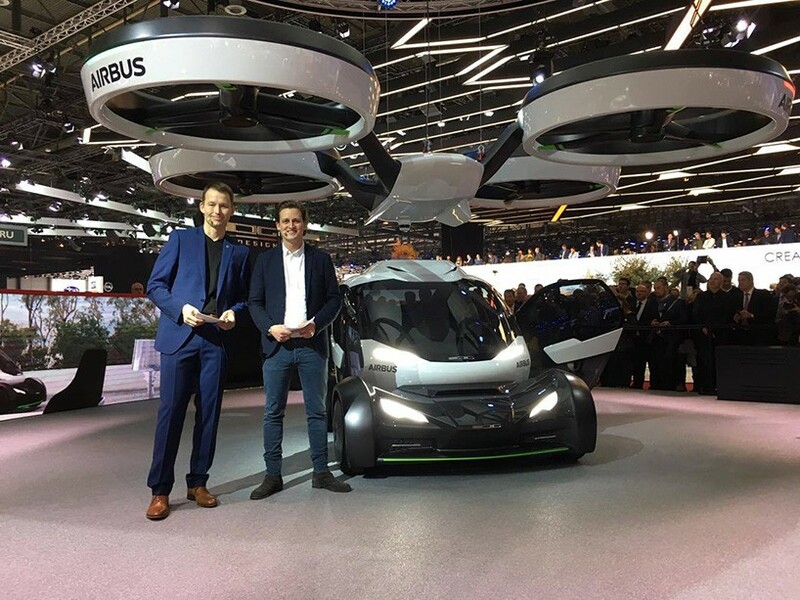 imagine a world where should you find yourself stuck in traffic, your car could vertically take off into the air and fly you to your destination? 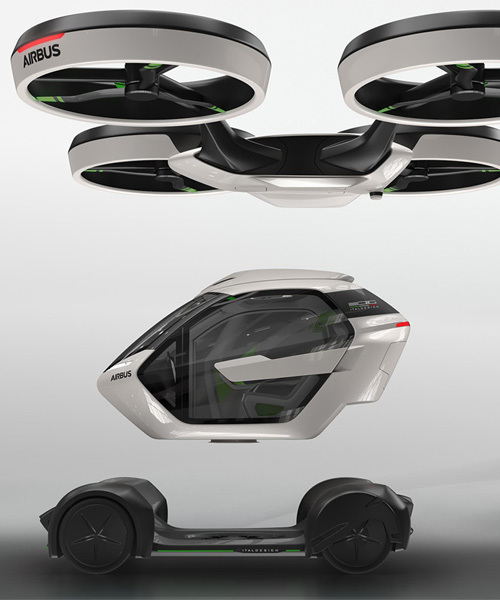 that’s exactly what airbus x italdesign’s latest drone-car prototype, presented at the geneva motor show 2017, is designed to do. 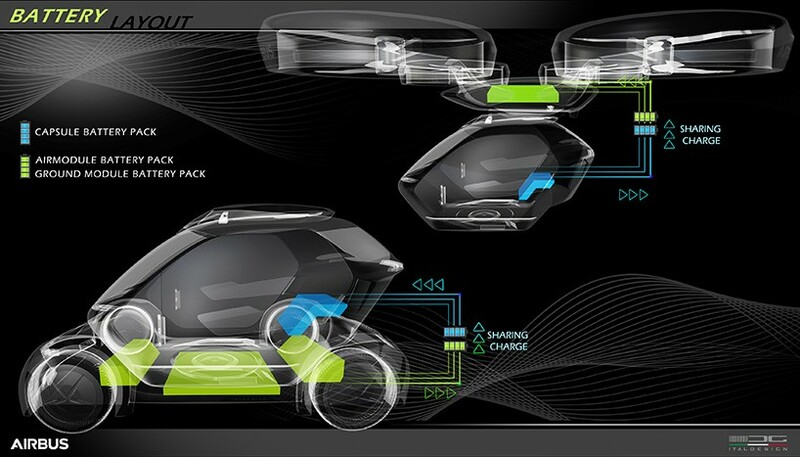 the aptly named ‘pop.up’ system consists of a passenger capsule that works just as well on the road as it does in the sky, thanks to it’s two different and independent electric propelled modules, one for the ground and one for the air. 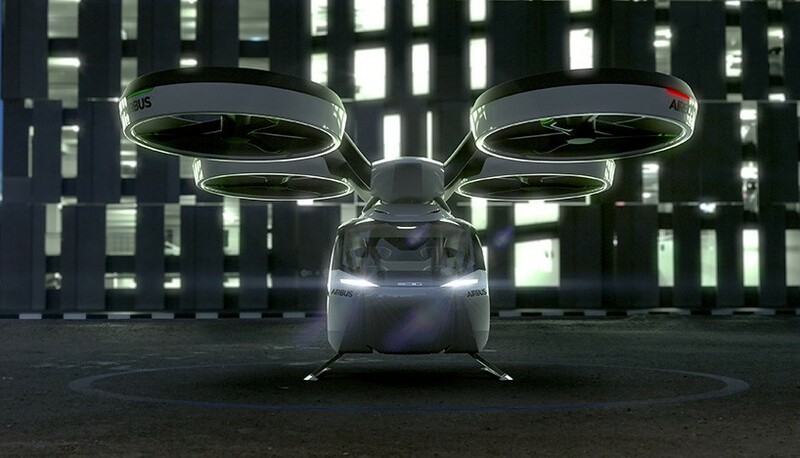 when the vehicle finds itself in highly congested traffic, the capsule disconnects from the ground module and is carried up into the sky by a 5 by 4.4 metre air module propelled by eight rotors. 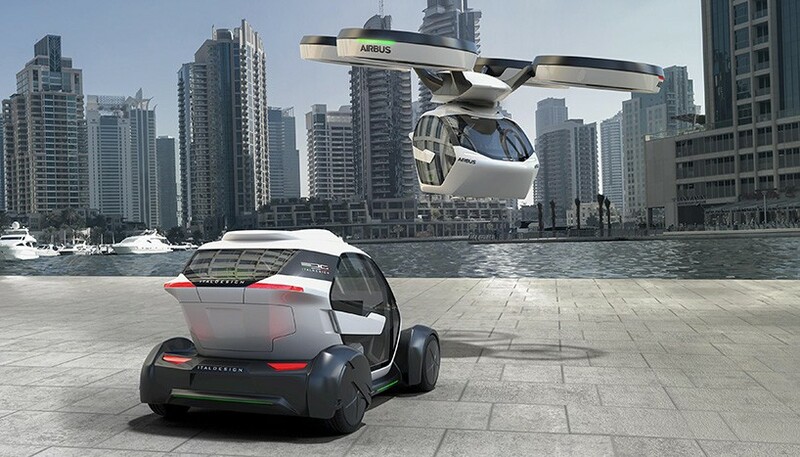 in such situations, pop up becomes a self-piloted flying car, taking advantage of the third demension to get from A to B efficiently whilst avoiding traffic. 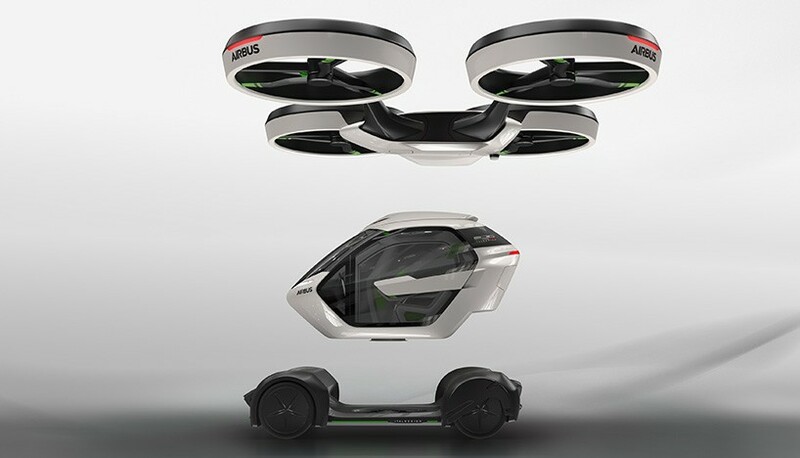 the vehicle combines the flexibility of a small two-seater ground vehicle with the freedom and speed of a vertical take-off and landing (VTOL) air vehicle. this means the passenger can go exactly where they want to without worrying about switching between different travel modes. 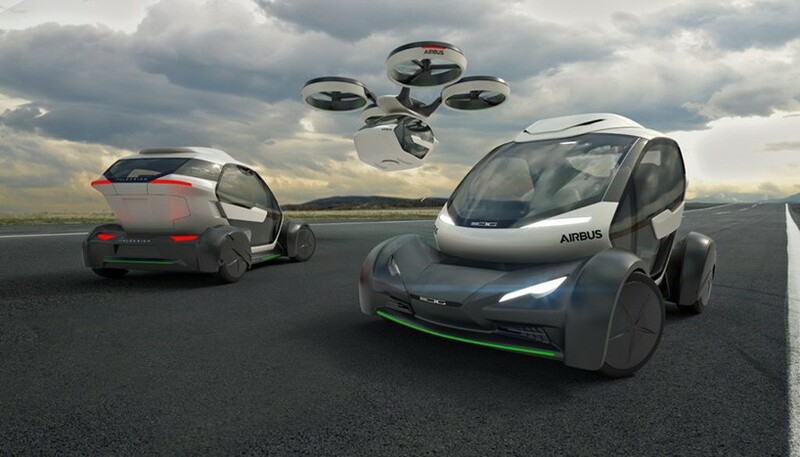 airbus and italdesign have created the system as a new user-focused way of moving efficiently through cities, and hopes to reduce traffic congestion as megacities start to become increasingly saturated. 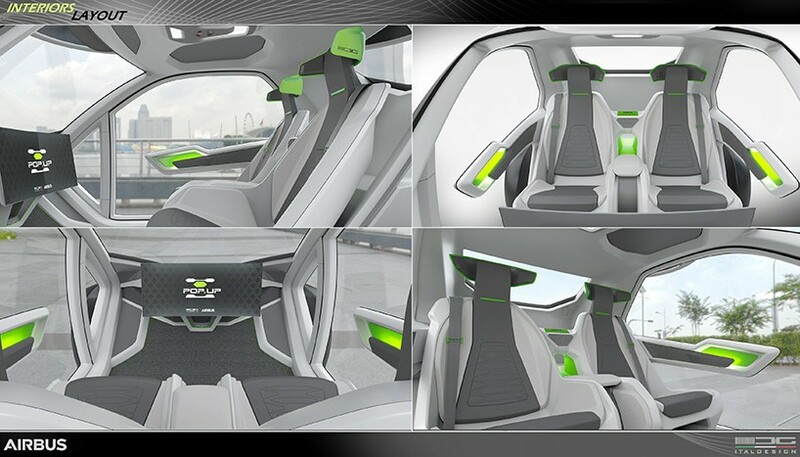 the drone-car hybrid comes in tandem with an easy-to-use app, allowing passengers to book their journey. the system judges the traffic congestion, costs and ridesharing demands, and automatically suggests the best way to arrive whether it be via road, sky, or both. once passengers reach their destination, the air and ground modules with the capsule autonomously return to dedicated recharge stations to wait for their next customers. jorg astalosh, CEO at italdesign elaborates, stating that ‘if you want to design the urban vehicle of the future, the traditional car cannot alone be the solution for megacities, you also have to think about sustainable and intelligent infrastructure, apps, integration, power systems, urban planning, social aspects, and so on.’ the duo hope that their multi-modal vision for thirst dimension travel will be the future of megacity transportation. It did not appear that the “car” was picked up when “stuck” in traffic – you have to drive somewhere to park it so it can be picked up. And, you cannot land anywhere because the high velocity air from the thrusters will cause all sort of debris to be blown around when it lands anywhere that is not clean.